Cigarette use is known to carry a risk of a wide range of health problems, but it is also problematic for patients with asthma. Although a specific allergy to cigarettes is not common, the smoke can irritate preexisting allergies and is especially dangerous for those with allergic asthma. Neck swelling associated with allergies and cigarettes is indicative of a type of serious reaction. Persistent neck swelling should be checked with a physician to ensure that it is not related to any other underlying health problems. Smoking poses the risk of long-term health diseases, but immediate effects can include coughing, breathing difficulties and a decreased immunity to infections and illnesses. According to the National Institute of Environmental Health Sciences, there is overwhelming evidence indicating that cigarette smoke induces allergic reactions. There is a particular risk of symptoms in patients with allergic asthma, and complications can include bronchitis and sinusitis. Neck swelling is a common symptom of a serious allergic reaction. Cigarette smoke allergies can often cause coughing, sneezing and rashes in some patients that are sensitive to the irritant. Bulges in the neck that are accompanied by swelling in the mouth and other parts of the face may be indicative of anaphylaxis, a potentially fatal allergic reaction. This type of severe body shock must be treated by emergency medical personnel immediately. If you have a cigarette smoke sensitivity, the best method of prevention is to stop smoking or to remove yourself from second-hand smoke. In some cases, you might experience neck swelling until the allergic reaction ceases. However, if you continue to experience swelling in the neck several days after a lack of cigarette smoke exposure, you should call your doctor to see if there is another underlying cause of your symptoms. Thyroid disorders and swollen lymph nodes are among the reasons you might experience persistent neck swelling. A 2009 Netherlands study conducted at Utrecht University found evidence that cigarette smoke helped limit allergic responses in mice. 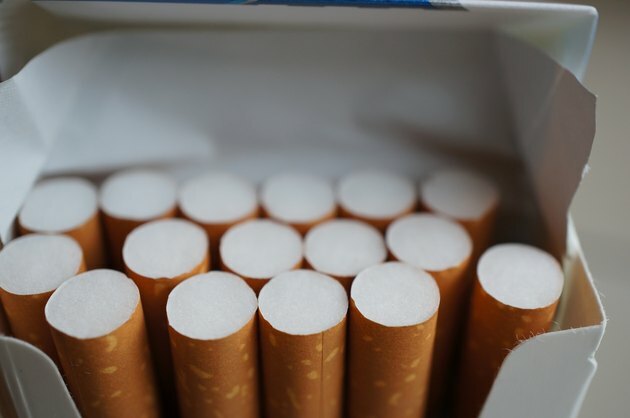 According to Science Daily, researchers injected a cigarette smoke solution into mice and found that it helped prevent their body cells from inflammatory proteins when exposed to allergens. This research experiment suggests that humans who already smoke might find a decreased risk of allergic reactions after smoking, but this is not a good enough reason to continue tobacco use. The study was only conducted in lab mice, and the risks of cigarette smoke far outweigh any possible benefits posed to allergy patients. Instead, persistent symptoms should be addressed with a doctor.